We didn't listen to the warnings. and now their guardians have arrived. You must pilot the 1981 Galencia Fighter and restore order. Galencia is a Galaga inspired action game from Jason Aldred. C64 or C128 in C64 mode, 1541/1571 Floppy, Joystick. This game is PAL and NTSC compatible. Galencia is a Zzap64! Julian Rignall Sizzler. Rob says: The best Modern C64 Shmup? And now, ladies and gentlefighters - get your joysticks ready and snitch the playable demo of the game! A playable demo version is available as a download, of course at no cost. PAL and NTSC compatible! If you want to play Galencia, the colourful Galaga inspired shoot-em-up, on your theC64 Mini there are no complicated procedures necessary. Just upgrade to the new firmware 1.2.0 and Galencia shows up in the Games Carousel of you theC64 Mini. And in case you missed the successful Kickstarter there is a limited time to still get the Special Backers Version including extras via IndieGoGo. We produced a new batch of Galencia tapes. 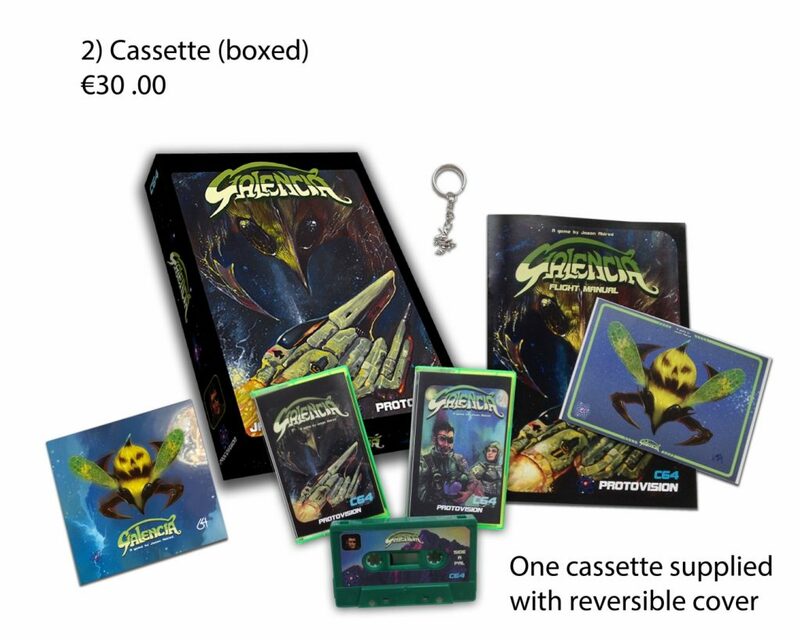 The C64 shooter is now available on all mediums: tape, disc or cartridge. You can get the tape version by itself or in a protovision carboard box. 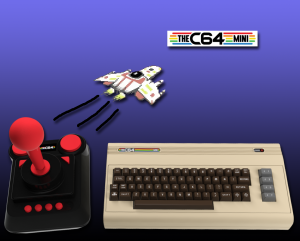 The C64 emulator kernal64 now supports our standard cartridge format, gmod2. This means that Sam’s Journey and Galencia cartridges will now run with the emulator as well. We have restocked Sam, Galencia and Bear. Also Rescuing Orc is available. We are working on restocking Heroes & Cowards and D42-Adventure System with a multi-lingual box design (the old one was German only). We are close to completing the long list of orders we’ve had, and shall be returning to faster delivery times soon. Sam’s Journey *and* Galencia are Games of the Year! We are very proud that BOTH games that we have published in 2017 have been selected as ‚Game of the Year‘ by different juries. 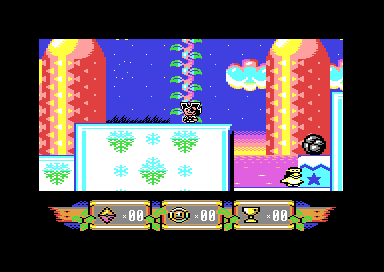 The C64 platformer Sam’s Journey was crowned GOTY by the (very informative!) 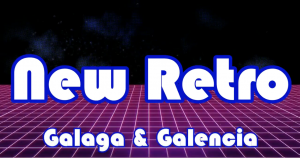 portal „Indieretronews“ and the C64 action shooter Galencia got first in the poll of the Reset magazine, with Planet Golf and Sam’s Journey right behind. You know why we love making C64 games? Because we have the best customers in the world! This is also the debut of our new cardboard box and we’re anxious to read your reviews and comments about the package. The first boxes already arrived at various destinations around the world! We are more than happy that those who received their package are very, very pleased. See the first photos and comments about Galencia and the full package on our Twitter account and order Galencia from our Shop. Only in 2017: Free Galencia Posters! 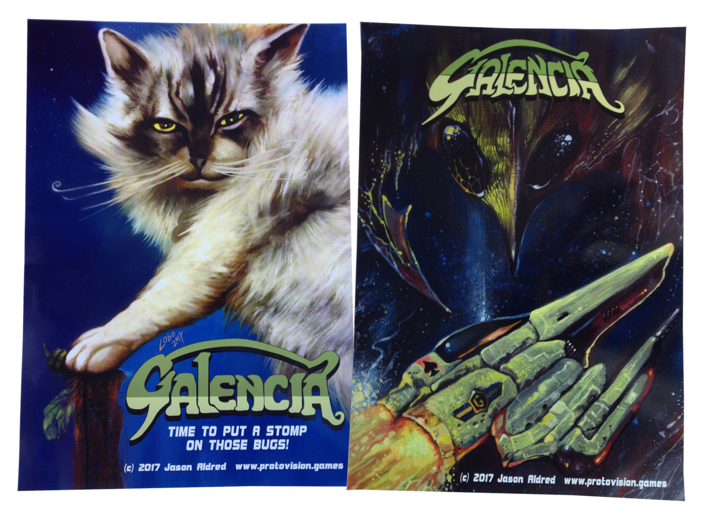 we are throwing in *two* Galencia posters (different motives) free of charge! This is a limited offer and is valid only UNTIL END OF YEAR.